In Japan, most people use bath salt or tablet when they take bath. So, there are all kinds of bath salt/tablets found at stores. 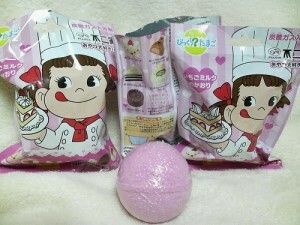 Today, let me introduce some bath tablets which have toys inside! The first one is “the skull tablet”. Mr. Skull introduces it as the popular bath tablet in the hell! When you put it into bath, it bubbles up like the hell (that’s what he says). For girls to play house, these Fries and Tempura series are perfect. The imitation foods come out from the tablets can be props for play house or accessories. This one has a small sweets toy inside of the tablet. Boys want to have fun too right? 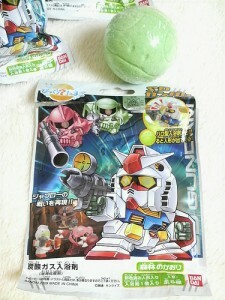 This one has a Gundam figure inside. These bath tablets are fan, so they will work for the children who don’t like bath. Or even grown ups will get motivated to take bath by these!